Novelists use SuperNotecard to experiment with storylines and to circle back, bear down and perfect their prose and characters—all with notecards that do not run out of room or fade with age. Researchers use SuperNotecard to gather facts, manage sources and finally stitch it all together in a way that is more visual and capable than a traditional outlining tool. With many export and print options, SuperNotecard is one click away from your favorite word processor or layout program. 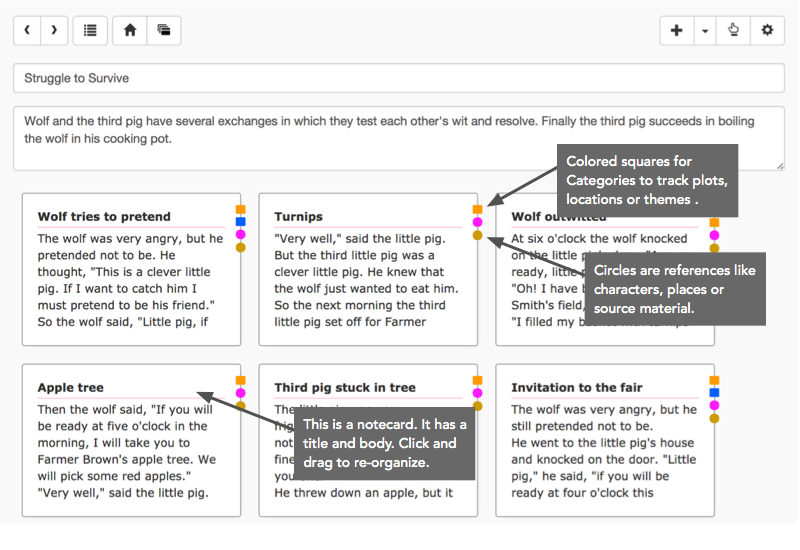 Notecards have colored tabs to signify relationships to categories and references like characters and sources. Use the deck display to move cards around. Put cards in columns or ‘flatten’ the hierarchy to see them all at once. Use the Outline view to see the composition with a wider lens. Begin each card with a title, jump to the description and assign it to a category. In just a few steps create the building blocks of your composition. Format with tables and bullets, embed images, add links, or invoke full-screen mode to eliminate distractions. Upload and attach other documents or use the pen tool to draw a quick sketch. Our notecards are truly super. SuperNotecard is designed to help with “works in progress”; use the flag feature to mark cards that need adjustments and add notes to remember what needs to be done. Profile your characters and itemize your sources in SuperNotecard’s References area. Add source details or in-depth character development and then link this information to relevant notecards. The relationships can be monitored from several angles. With a few clicks review all cards that reference a particular source. From the deck display instantly see where your main character is introduced. Using the assortment of export and print options, output individual cards and include an inventory of references or append a properly formatted bibliography. Virtual notecards work great for organizing screen and stageplay scripts. Each card represents a scene and can be timed and categorized by plot, setting or location. Use references to attach characters or supporting material. The flag feature works great for keeping notes. SuperNotecard exports and imports FinalDraft and Fountain files so it is simple to move your work to and from other scriptwriting tools. Instantly find sections of writing by keyword, category, character or source. You are welcome to try out SuperNotecard for free. Create an account to start writing with notecards. © 2019 Mindola Software. All rights reserved.